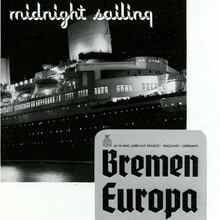 Designed by Max Bittrof and released in 4 styles by Bauer in 1933–34. Two weights were adapted for the Intertype as Element-Fraktur. In 1936, Bauer added a set of decorated caps (with fine verticals accentuating stems, and diagonals structuring counters) to all 4 styles. Photo-Lettering offered this typeface as Seidelburg Heavy. All 4 styles plus an open shaded style are digitally available from Gerhard Helzel. See also Autobahn Fraktur .